The disgraced 28-year-old man was taken into custody by police in Sanford, Florida on Saturday (10Jun17) after his current girlfriend accused him of physically assaulting her. “At 8:04 a.m. this morning, a female came to the Sanford Police Department to say that she had been battered and that Nick Gordon would not allow her to leave the residence,” the Sanford Police public information officer informed Us Weekly in a statement, before noting authorities arrested him hours later "at the pool area of the residence". According to TMZ, his girlfriend alleges Nick beat her up so badly on Friday (09Jun17) night she was forced to visit the hospital to seek treatment for her injuries. After she was released from the medical facility, she went to the police station to file a report in which she claims she was physically assaulted and held hostage by Nick in the home. In photos obtained by the outlet, Gordon's girlfriend is pictured with several deep bruises across her upper and lower arms. Following his arrest, Nick is now being held in jail without bond. The fresh domestic violence allegations come several months after Gordon was deemed legally responsible for Bobbi Kristina's demise after he lost a wrongful death lawsuit in September (16). He was ordered by the courts to pay $36 million (£27.8 million) in damages to her estate and a criminal case against him for Bobbi Kristina's death is still underway. Nick dated Bobbi Kristina, who is the daughter of dead R&B icon Whitney Houston and New Edition musician Bobby Brown, for three years until her tragic death in July, 2015. 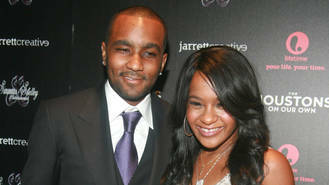 Bobbi Kristina was in a medically induced coma for six months after being found facedown and unconscious in January, 2015, in the bathtub of the Georgia home she shared with Gordon. During the wrongful death case trial, executors of Bobbi Kristina's estate accused Gordon of physically assaulting her and providing the late aspiring singer with a "toxic cocktail" of substances that rendered her unconscious the night she passed away. She died at the age of 22.